(Press release) Mammoth Lakes, CA – Mammoth Lakes Recreation announced today that it has received a pledge for $75,000 from local geothermal energy producer Mammoth Pacific Geothermal to assist with the construction of a new inclusive playground in Mammoth Lakes. 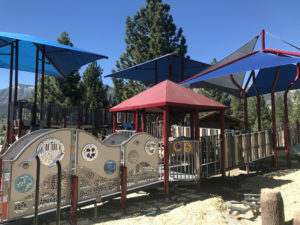 Truax, along with Town of Mammoth Lakes Parks and Recreation Director Stuart Brown, were instrumental in securing grant funding to help build the playground, which will be designated a National Demonstration Site (NDS) for inclusive play after it opens. Formed in 2014, Mammoth Lakes Recreation’s mission is to deliver cutting edge sustainable recreation, mobility, and arts & culture opportunities and infrastructure for the benefit of the community and natural environment of Mammoth Lakes. We work to fulfill our mission by focusing our efforts in three areas: capital projects, advocacy, and entrepreneurship. For more information, go to www.mammothlakesrecreation.org.